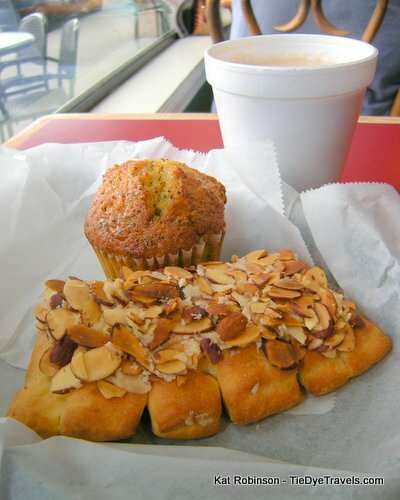 Breakfast pastries on Main Street at Little Rock's Community Bakery. 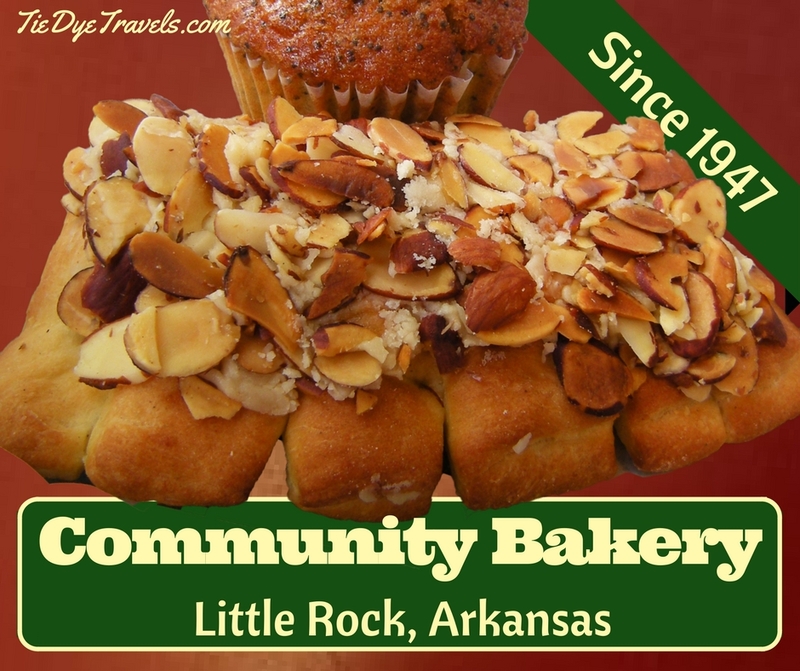 An Arkansas classic, Community Bakery has served pastries and fresh bread to the city of Little Rock since 1947. 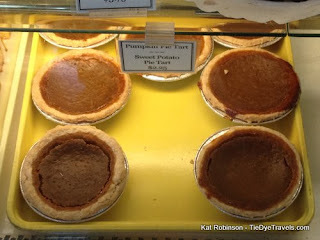 Find out why this Main Street mainstay has managed to stick around as one of my go-to places in the capital city. 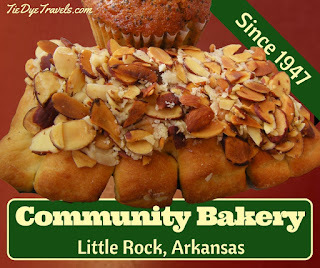 There's just something about Community Bakery. 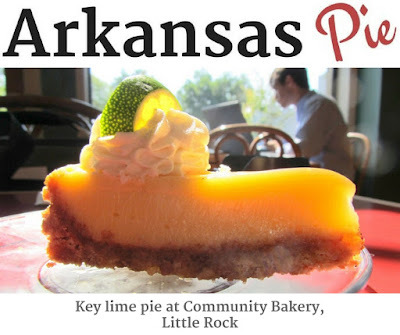 Its roots dig back far into the past of the metropolitan area, all the way back to the post-World War II era, back when Ralph Hinson first opened it up in 1947 in North Little Rock. It's been here, across the river in Little Rock proper since 1952 in one form or another. And since 1993 it's been in its current location at 12th and Main Streets. 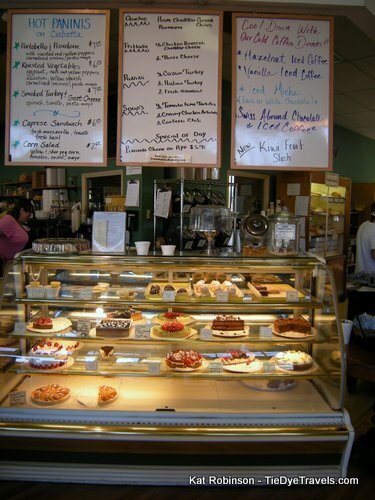 I’ve been privy to many of the delicacies behind the long glass counter over the years. 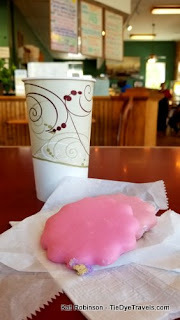 The bakery serves up my favorite version of the chocolate chip cookie -- a little Toll House cookie lump, asymmetrical in shape and crispy on the edges. Just like I’d make them at home -- if I had the time any more. 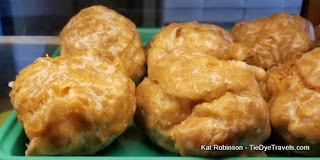 We used to have “birthday doughnuts” when I was back at the TV station -- where one of us would go at 6am to pick up a box of assorted doughnuts and muffins to share when the show got done. I got to intimately know the different flavors and variations. traditional beignet with the texture of a fresh rustic French loaf. Many has been the time when I’ve gone by at the end of the day and picked up “day olds” to take home. Invariably I arrive at the house and step out onto the carport and dust off the powdered sugar that’s covered me during the drive. And the sour cream doughnuts… well, they’re something else. 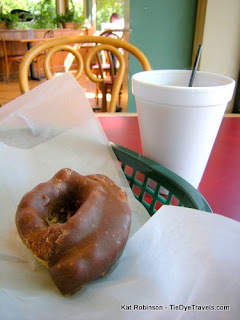 Community Bakery covers doughnuts pretty succinctly, with glazed rounds and fills and cake doughnuts. 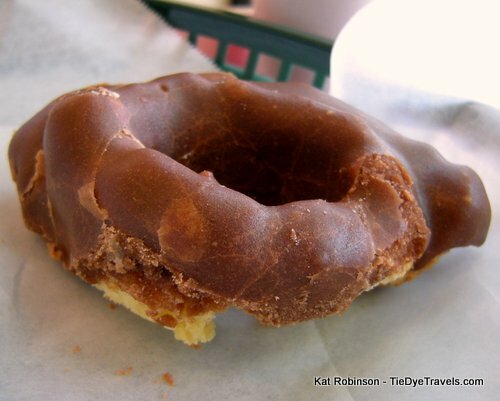 But there’s something about the texture of the old fashioned sour cream doughnut -- sweet but also a little tangy and salty at the same time, either glazed clear or with chocolate like this one. They’re ugly little things, the sort of thing you’d cringe at if you saw it on the table at a cotillion. But damn, they are the best thing in the world for soaking up coffee. Coffee… that’s another thing. So many good places to eat have gone to these gourmet upscale coffee drinks… yes, Community Bakery has done that, too. But you get what you pay for. You can have your double shot café au lat decaf fatcalf whatever… or you can choose from six different daily coffees. Or, if you’re like me and you just want a cup of joe, you can just get the house coffee. It’s cheaper and it’s still great, and you can still have your sweetener or half-and-half. But I keep going back to the muffins. When you order in advance, you can get mini-muffins that you can bring somewhere and look pretty smart, all those little flavors to try out. Still, they’re just the right size for a regular eight ounces or so of coffee. My favorite is the almond poppy-seed, but there’s an almost as good lemon poppy-seed as well, brighter in flavor than the almond poppy-seed but not overpowering. The orange cranberry ones are a little pungent. The cappuccino chocolate chip ones are decadent. 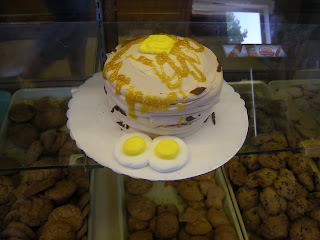 So I stopped in the other day and had a late breakfast of sweet stuff. Probably not the most substantial thing I could have had, but what the heck. I went in searching for cream cheese filled and spinach-feta filled croissants -- but both had already sold out. Unable to enjoy the sausage roll or a ham-and-cheese croissant, I erred on the sweet side and chose a lemon poppy-seed muffin and a bear claw. They were deposited in a little green basket for me and I took them and my empty coffee cup and found a seat. Got back up to fill said coffee cup and came back. The bear claw is another strangely massive thing that, unlike its equivalent at the average doughnut shop, dances on the line between savory and sweet and sticks its tongue out to both. 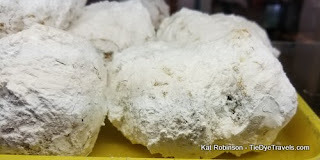 Made from a bread dough instead of a doughnut dough, it’s a baked item stuffed with almond paste and then smothered with slivered almonds on top. The filling can be a little too sweet for me sometimes, but once again there’s that coffee factor, it’s great to balance when you take yours black. Or even with some cream. There’s even a little saltiness to it. In case you're wondering, Community Bakery does also offer glazed doughnuts, cake doughnuts, doughnut holes and chocolate milk... ask me how I know. As I sat there knoshing my quick and quiet breakfast, I looked around. The place really hasn’t changed that much in years. There’s still multiple registers -- one at the drive-up window on the end, near the day-old rack down by the paper stands. There’s one at the other end of the big glass cabinet. 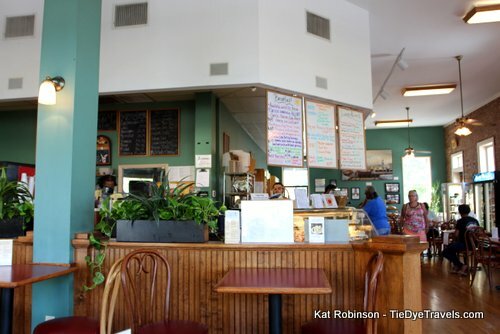 A third handles fancy-pants coffee drinks and lunch fare, such as the daily Panini and frittata. One of the back walls hosts a cold drink case with juices and milk and cold pastries to take with you. None of this has changed in years, but it’s still neat as a pin. There’s local artwork for sale, but it doesn’t really clutter the vast walls. There’s always a paper or two on the stand by the cake case with the latest edition of the Arkansas Democrat Gazette… which isn’t free; sometimes there’s a Times there, which is. Plenty of reading material. You can even ask for a box of checkers or chess to play while you’re relaxing there. But what makes Community Bakery truly special is the wide variety of people who darken the door. People from all walks of life come in -- from the high-end businessman catching a bite on his lunch hour to the homeless man coming in from off the street for a doughnut and some joe. There are artists, there are SOMA (South Main) residents, there are West Little Rock folks who don’t want to go home for a meal. In the morning you get the high-heeled ladies clacking their way across the floor to pick up a sandwich for later in the day… or finely shined leather shoes standing in line for a to-go bag. Later in the morning the sneaker set comes in and relaxes where those earlier in the day had rushed through. In the evenings you’ll sometimes find local musicians and their fans pass through, perhaps grabbing a quick bite before heading down to a gig at a packed Juanita’s. The one-percenters feel comfortable. So do the movers and the shakers. deep the soups can travel into your gullet and soul to warm you in the coldest months. I could even share notes on the fine varieties of baked breads… but that’d take a whole lot of time. I could even go on about its rich history… but they cover that quite well on the Community Bakery website. You’ll find lots of specials and menus there, too. boot. 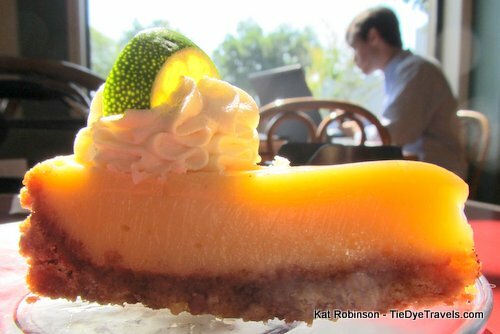 This particular slice of Key lime pie is on the cover of that book... and for good reason. Today, when you go in the side door like I usually do, you'll find a revolving pie case just waiting with all sorts of pastries inside. And here's the thing - the photos in this very story cover ten years of Community Bakery. 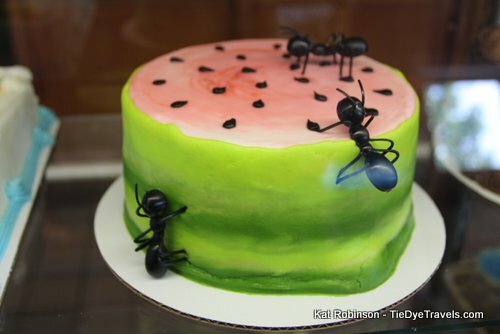 Though times change, this bakery does not. When you stand the test of time, why change? 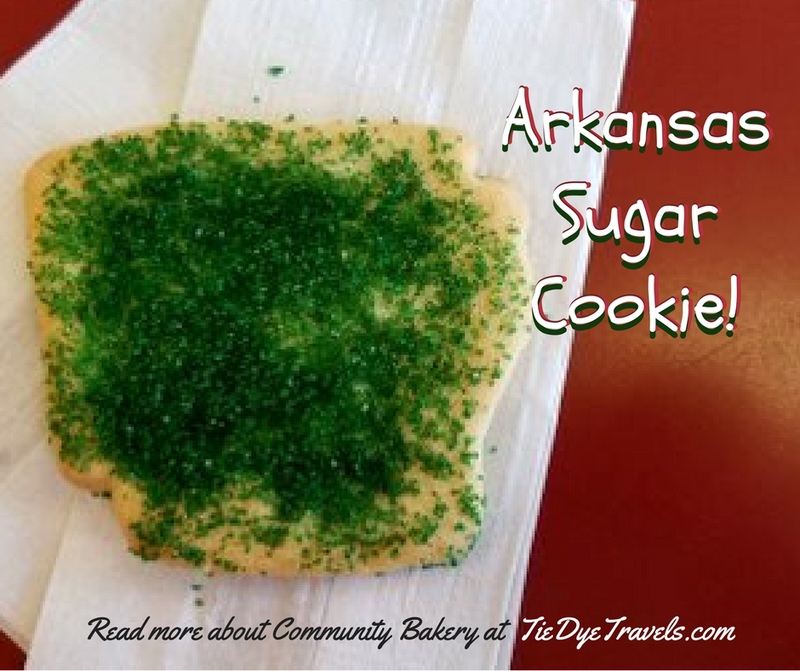 You’ll find Community Bakery downtown on Main Street, just south of I-630. Parking is mostly on the street, though there are a few spots out back in a little lot. There’s a drive-up window if you’re really in a hurry. It’s open from six in the morning until eight at night most days, six to ten at night on Fridays and Saturdays and seven to six on Sunday. (501) 375-6418. Oh, there’s a West Little Rock location, too. For more information, check out the website or the Facebook page. Very nice article. Like detail blogs. I love this post! I can't wait to go to this bakery when I'm down in Arkansas this winter from Nov-Feb.
You got me with the spinach-feta filled croissants. And I wouldn't be able to pass up either the sausage roll or the ham-and-cheese croissant. I can't believe you can get a bear claw for $1.45! I have always enjoyed pastries anything that was sweet. 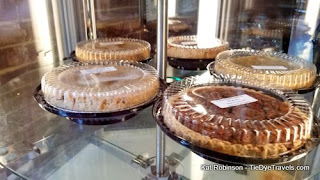 I looked forward to the homemade coffee cakes we had each Saturday morning. Unfortunately with age came diabetes and now I can only look on with fond memories.